Patient is a 1 yr old, MN, Pomeranian that presented to orthopedic surgeon for evaluation of a grade II lameness (of weeks duration) affecting the right thoracic limb. 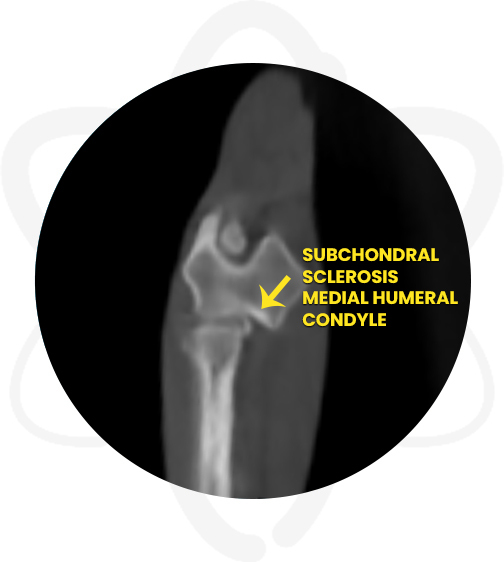 Physical exam and radiographs revealed that the right elbow is not congruent when in flexion and the anconeus appears less dense and blunted. A CT scan of the elbows was requested to further evaluate the joints. CBC/Chem: pre-renal azotemia, mildly elevated phosphorus. Patient was anesthetized and a CT scan of the elbows was performed. When evaluating bones only, Omnipaque ™ (contrast agent) is not necessary, making the anesthesia time shorter for this procedures. Oftentimes due to the complexity of the lameness, the shoulders are also scanned during the same procedure to complement the evaluation. For shoulders we do administer IV contrast to enhance all soft tissue structures. Provided the surgeon specific information regarding the suspected right elbow joint incongruency and determine the best treatment plan. The diagnosis of forelimb lameness in some of our patients can be very exhaustive and challenging. Lameness of the elbow and/or shoulder many times require the use of multiple diagnostic modalities. 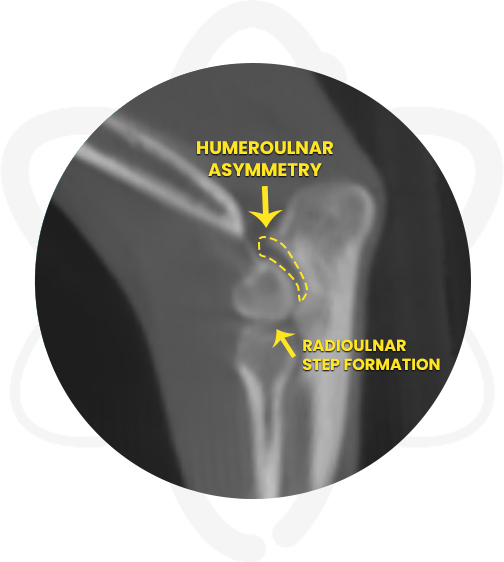 Elbow lameness in our canine patients can be multifactorial with conditions such as joint incongruity, fragmented coronoid process, osteochondrosis of the medial humeral condyle and ununited anconeal process. Similarly, shoulder lameness can be caused by different etiologies which include, but are not limited to, medial shoulder instability, osteochondritis dissecans, osteoarthritis and biceps tendinopathy. In many cases, performing a CT scan will yield valuable information in order to determine the best treatment plan and prognosis. However in some cases CT scanning would be used in addition to arthroscopy and/or MRI to diagnose some of these conditions.